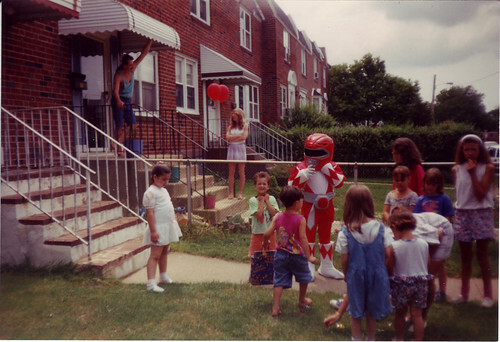 This was a birthday party for one of our neighbors’ sons. They are friends of the family. The birthday boy is that kid in the neon green shirt standing next to me. This party took place over the summer of 1994. 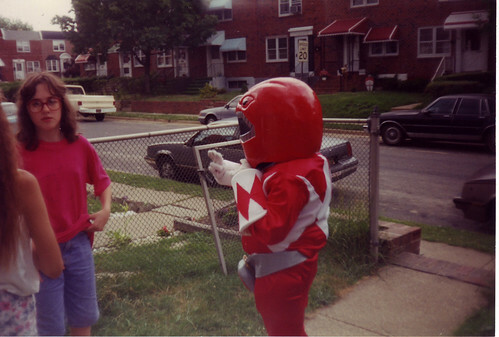 I’m 12 at the time and, to this day, I’m not sure how I ended up being the one in that costume. I mean, I was a drama major in a performing arts school at the time but, seriously, I was nowhere near the correct size for the costume. There was no lack of taller, more appropriately sized men about, either. Take the father of the birthday boy, standing on the steps in the background, for example. Anyway, you remember who the Power Rangers are, right? Tall, muscular and annoyingly attractive (even the nerdy one) “high school kids” wearing skin-tight body suits while fighting big, bad monsters. Amusingly, I was wearing a few layers of clothes underneath the costume to try to look like I had more muscles, because my 12 year old mind thought that would be a good idea. You can see from the photograph above that that didn’t work out so well. Oh, and did I mention that the costume was way too big? I’ve loved checking out your old family photos on Flickr! The one of you dressed up like a doctor is adorable. Thanks!! Too bad I don’t still look like that… only older… and with more money! !